What are three things you should know before hiring your next pressure washing company? Keep reading to find out! 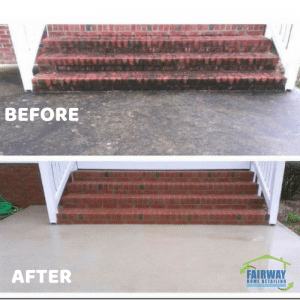 When we say pressure washing, in this case, we are referring to driveways, decks, fences, or anything you would wash on your property. For house pressure washing, Click Here. When calling different companies, you want to ask the following questions: What chemicals/detergents do you use? What pressure do you use? What type of insurance do you have? Let’s dig in deeper into the chemicals used. Different surfaces are going to require different cleaning solutions. If you’re washing a wooden fence, asphalt roof or concrete driveway, you will need completely different detergents. Using the wrong type of detergent can still give you visually appealing results but can cause lasting damage, such as dead plants. Bleach should never be used as the sole detergent! It should always be mixed with another detergent that boosts its effectiveness. The second question you should ask deals with pressure. How fast and hard the water comes out of the pressure washing wand has a huge impact on the damage to the surface being cleaned. A wooden fence is washed with much lower pressure than a concrete driveway. The pressure should always be specific to the surface being cleaned and the majority of surfaces will be cleaned using a lower pressure. The third question you should ask is ‘Are you insured?’. The type of insurance that is important to you as a homeowner is Workers Compensation insurance. If someone gets hurt on your property while working, which we hope never happens, you would be liable if the company does not have worker’s comp insurance. You may have hired someone to wash your deck and all of a sudden you are responsible for paying for their broken leg. We avoid situations like this by having worker’s compensation insurance. To make sure a company is fully insured, you want to get a certificate of insurance. This is sent directly from the insurance agent NOT the company. This helps protect you as a homeowner. Another type of insurance a company should have is liability insurance. With liability insurance, if a company damages your fence or concrete driveway, whatever is being washed, then the insurance covers the cost of repairs or replacements. Keep these points in mind the next time you hire a company to do any pressure washing. Comment below if you have any questions. Additional ways we protect you and your home. As an extra measure, we tape around any outlets, doorbells and other water sensitive areas to make sure they aren’t exposed to water. The tape we used is safe on paint and will not damage your home. When pressure washing concrete surfaces, you should not use a pressure washing wand. When using a wand, you are hitting the concrete at different angles which does not give you an even clean. Instead, we use a surface cleaner which ensures you don’t get to close to the surface to where you can damage the concrete and that there is an even clean. 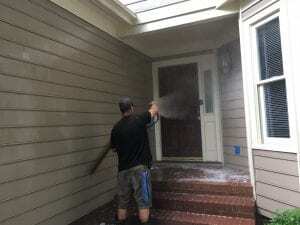 Call the office at (919)-388-2204 to learn more about our pressure washing services. We serve the Triangle area, including but not limited to Raleigh, Durham, Chapel Hill, Cary, Apex, Knightdale, Wake Forest.